How Rocks and Minerals are formed. Igneous, Sedimentary, Metamorphic rocks. The whole earth is made of rocks & minerals. Inside the earth there is a liquid core of molten rock and on the outside there is a hard crust. If you compare the earth to an egg, the shell on an egg is like the crust on the earth. The crust is made up of rocks and minerals. Much of the crust is covered by water, sand, soil and ice. If you dig deep enough, you will always hit rocks. Below the loose layer of soil, sand & crumbled rocks found on Earth is bedrock, which is a solid rock. The Crust makes up less than 1% of the Earth’s mass (0.4%) It is made of oxygen, magnesium, aluminum, silicon, calcium, sodium, potassium, iron. There are 8 elements that make up 99% of the Earth’s crust. The continents are about 35 km thick and the ocean floors are about 7 km thick. The Mantle is the solid casing of the Earth and is about 2900 km thick. It makes up about 70% of the Earth’s mass (68.1%). It is made up of silicon, oxygen, aluminum and iron. 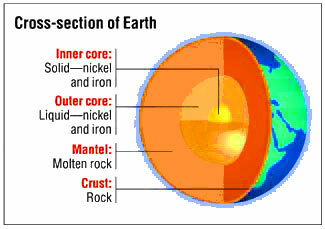 The Core is mainly made of iron and nickel and makes up about 30% of the Earth’s mass (31.5%). The Outer Core is 2200 km thick and is liquid and the Inner core is 1270 km thick and is solid. The rocks you see around you - the mountains, canyons & riverbeds, are all made of minerals. A rock is made up of 2 or more minerals. Think of a chocolate chip cookie as a rock. The cookie is made of flour, butter, sugar & chocolate. The cookie is like a rock and the flour, butter, sugar & chocolate are like minerals. You need minerals to make rocks, but you don't need rocks to make minerals. All rocks are made of minerals. A mineral is composed of the same substance throughout. If you were to cut a mineral sample, it would look the same throughout. There are about 3000 different minerals in the world. Minerals are made of chemicals - either a single chemical or a combination of chemicals. There are 103 known chemical elements. Minerals are sorted into 8 categories. Some common examples have been listed for each. Crystals are minerals that have had the chance to grow in the shape that they were meant to be. Just like your DNA determines the colour of your eyes, how tall you will get to be and the shape of your bones, the chemicals that a mineral is made of determines what shape it gets to be. We can tell different minerals apart by what crystal shape they are. Sometimes minerals form in spaces where there is not a lot of room, so they don't have a crystal shape. When there is just a big hunk of a mineral, it is called a massive mineral. If there is a definite shape with easy to see flat sides, it is called a mineral crystal. Most of the earth's crystals were formed millions of years ago. Crystals form when the liquid rock from inside the earth cool and harden. Sometimes crystals form when liquids underground find their way into cracks and slowly deposit minerals. Most mineral crystals take thousands of years to "grow" but some like salt (halite) can form so quickly that you can watch them grow at home! Some people think of crystals as clear pretty rocks that are used for jewelry. Amethyst is a very common quartz crystal. Crystals do not have to be clear, but those are the kinds you will usually see in the stores. When rocks break down into smaller & smaller pieces, they turn into sand. If you look at the sand under a microscope, you will see that sand is made up of the same minerals as the rocks that the sand came from. When plants start to sprout up in sand, it is turning from being just small bits of rock to being soil. Erosion is a key part of the Rock Cycle. It is responsible for forming much of the interesting landscape that is around us. It is also a major problem as people live in areas in large numbers and get used to the environment being in a certain way. People can do things to increase erosion or slow it down. Erosion happens mainly as a result of weathering. Water causes much erosion. When it fall as acid rain, it can dissolve rocks that are sensitive to acid. Marble & limestone weather when exposed to the rain. When the rain falls very heavily, as in monsoons, then flooding can happen. Rivers with a lot or rushing water can cause mud slides and erode river banks. The action of waves on a beach causes much erosion. The waves pound on the rocks & over time, cliffs crumble. That is why you will often find sand & little pebbles on beaches. Rushing water, like what you find in rivers that move quickly in the mountains or strong waves on the shores of oceans, roll rocks around. This causes the sharp edges of the rocks to get knocked off & that is why river rocks are so smooth & beach pebbles look polished. The freeze / thaw cycle causes mountains to crumble over time and large rocks to break down into little rocks.When water gets into cracks in the rocks, this water expands during the freeze cycle, making the cracks bigger. The when the cracks fill up with water in the thaw period, it allows more water to go deeper into the rock which will make the rocks split apart when they freeze again. Wind, when it carries bits of sand and grit, can blast away layers of rocks.The wind can easily pick up little bits of sand and then sandblast the rocks that are in the wind's way. Sometimes only the soft layers of the rock are eroded, leaving interesting shapes. This kind of erosion usually only happens in very dry, desert like areas. Igneous means made from fire or heat. When volcanoes erupt and the liquid rock comes up to the earth's surface, then new igneous rock is made. When the rock is liquid & inside the earth, it is called magma. When the magma gets hard inside the crust, it turns into granite. Most mountains are made of granite. It cools very slowly and is very hard. When the magma gets up to the surface and flows out, like what happens when a volcano erupts, then the liquid is called lava. Lava flows down the sides of the volcano. When it cools & turns hard it is called obsidian, lava rock or pumice - depending on what it looks like. There are 5 kinds of igneous rocks, depending on the mix of minerals in the rocks. Diorite contains feldspar & one or more dark mineral. Feldspar is dominant. Gabbro contains feldspar & one or more dark mineral. The dark minerals are dominant. Periodotite contains iron and is black or dark. Pegmatite is a coarse-grained granite with large crystals of quartz, feldspar and mica. Obsidian is nature’s glass. It forms when lava cools quickly on the surface. It is glassy and smooth. Pumice is full of air pockets that were trapped when the lava cooled when it frothed out onto the surface. It is the only rock that floats. When mountains are first formed, they are tall and jagged like the Rocky Mountains on the west coast of North America. Over time (millions of years) mountains become old mountains like the Appalachian Mountains on the east coast of the United States. When they are old, they are rounded and much lower. What happens in the meantime is that lots of rock gets worn away due to erosion. Rain, freeze/thaw cycle, wind and running water cause the big mountains to crumble a little bit at a time. Eventually most of the broken bits of the rock end up in the streams & rivers that flow down from the mountains. These little bits of rock & sand are called sediments. When the water slows down enough, these sediments settle to the bottom of the lake or oceans they run into. Over many years, layers of different rock bits settle at the bottom of lakes and oceans. Think of each layer as a page in a book. One piece of paper is not heavy. But a stack of telephone books is very heavy & would squish anything that was underneath. Over time the layers of sand and mud at the bottom of lakes & oceans turned into rocks. These are called Sedimentary rocks. Some examples of sedimentary rocks are sandstone, shale, marble and jasper. Sedimentary rocks have fossils in them because plants and animals that have died get covered up by new layers of sediment and are turned into stone. Most of the fossils we find are of plants & animals that lived in the sea. They just settled to the bottom. Other plants & animals died in swamps, marshes or at the edge of lakes and were covered with sediments when the size of the lake got bigger. When large amounts of plants are deposited in sedimentary rocks, then they turn into carbon, which gives us our coal, oil, natural gas and petroleum. A large sea once covered the central part of Canada and the climate was very tropical. In time, sedimentary rocks formed there. That is why we find dinosaur fossils in Alberta and the area is a good source of natural fuels. When rocks are exposed to the elements – air, rain, sun, freeze/thaw cycle, plants – erosion occurs and the little bits of rock worn away get deposited as sediments. Over time, these sediments harden as they get buried by more sediments and turn into sedimentary rocks. 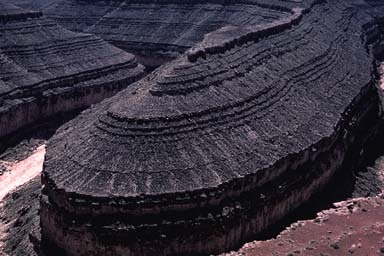 Sedimentary rocks are usually formed in layers (strata). There are 6 main kinds of sedimentary rocks depending on the appearance of the rock. Conglomerate rock has rounded rocks (pebbles, boulders) cemented together in a matrix. Sandstone is a soft stone that is made when sand grains cement together. Sometimes the sandstone is deposited in layers of different coloured sand. Limestone is a rock that contains many fossils and is made of calcium carbonate &/or microscopic shells. Gypsum, common salt or Epsom salt is found where sea water precipitates the salt as the water evaporates. Porphory rock is when jagged bits of rock are cemented together in a matrix. Metamorphic rocks are rocks that have changed. The word comes from the Greek "meta" and "morph" which means to change form. Metamorphic rocks were originally igneous or sedimentary, but due to movement of the earth's crust, were changed. If you squeeze your hands together very hard, you will feel heat and pressure. When the earth's crust moves, it causes rocks to get squeezed so hard that the heat causes the rock to change. Marble is an example of a sedimentary rock that has been changed into a metamorphic rock. Metamorphic rocks are the least common of the 3 kinds of rocks. 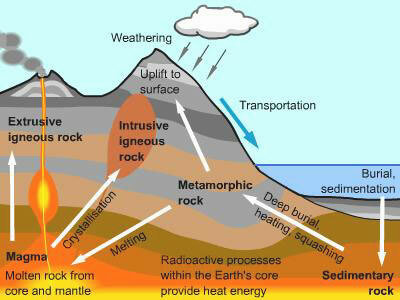 Metamorphic rocks are igneous or sedimentary rocks that have been transformed by great heat or pressure. Foliated metamorphic rocks have layers, or banding. Slate is transformed shale. It splits into smooth slabs. Schist is the most common metamorphic rock. Mica is the most common mineral. Gneiss has a streaky look because of alternating layers of minerals. Non-foliated metamorphic rocks are not layered. Gemstones are often what people mean when they talk about "crystals". There are many gemstones and most are used for jewelry or decoration. The are minerals that are usually transparent and have been cut and polished. Some gemstones look similar to what the mineral looks like when found in nature and others are very different. Few minerals found in nature are suitable to use unaltered in jewelry. One exception is the "Herkimer Diamond" which forms in vugs of gray rock and are found near Herkimer, New York These are not real diamonds - they are quartz crystals that look like they have been cut & polished like a diamond.